AC/DC’s recovery from this seemingly irreversible setback remains one of music’s greatest stories– the band found a new lead singer in blue collar Englishman Brian Johnson, and proceeded to release Back in Black, which now ranks as the second-highest-selling album in human history (bested only by Michael Jackson’s Thriller). Astoundingly, in the face of such thorough cultural saturation, precious little has been known of the men behind the instruments. A notoriously private group, the inner workings of AC/DC are as transparent as a grand jury proceeding. 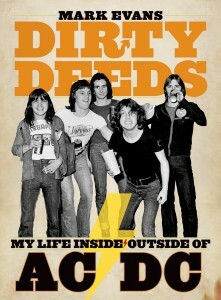 Enter Mark Evans’ Dirty Deeds: My Life Inside/Outside AC/DC, the first-ever account of the band from the inside. Evans played bass in AC/DC from 1975 through 1977, performing on groundbreaking albums such as High Voltage, Dirty Deeds Done Dirt Cheap and Let There Be Rock. Although his tenure accounts for a small fraction of the band’s 38-year career, Evans captures AC/DC at the most critical period– when they were hungry, arrogant and bloodthirsty for zero sum success. His account of the band’s genesis yields insights that shine brightly through to the present day. Clocking in at just south of three hundred pages, Dirty Deeds moves quickly and packs a surprising emotional punch. Evans is a charismatic and gifted storyteller, peppering his narrative with thick Aussie dialect and undercurrents of humor and self-deprecation that create an intimate, conversational narrative. Evans’ three years touring and recording with AC/DC account for the lion’s share of the material, and fans won’t be disappointed. Beginning with his audition for the band through his unceremonious dismissal in London in 1977, Evans issues a page-turning, unsparing look at the personalities and attitudes that dominated that group. Brothers Malcolm and Angus Young, who founded AC/DC in 1973, are seen as the band’s creative, financial and strategic shot-callers, dictating virtually all aspects of the group’s operations and soliciting minimal input from the other three members. While their passion for making music and for achieving commercial success is white hot, their interpersonal skills evoke images of towering glaciers. Evans describes frontman Bon Scott as savvy enough to stay close to the brothers and tow the company line, but whenever circumstances allowed, Bon was out the door, eager to enjoy the trappings of the rock and roll lifestyle away from the Youngs’ sharp, puritanical assessments. Though prone to mood swings and often quick with his fists, Bon was above all a well-mannered, good-natured hippie– far from the Satanic heavy metal figurehead he is often considered to be. Bon’s friendship with Evans actually strengthened in the wake of Evans’ departure, and his recollections don’t inflate Bon’s legend so much as they infuse the singer’s memory with some much-needed dignity. At a particularly low point for the band in 1977, Malcolm fired Evans, ostensibly because the band wanted a bass player with stronger singing abilities. Anyone who has ever heard the vocals of replacement bassist Cliff Williams will understand just how hollow Malcolm’s reason rings. Evans was likely sacked because the band had themselves been recently dismissed from their tour with Black Sabbath, ironically due to Malcolm’s inability to keep his cool. It is no stretch to posit that Evans, whose playful nature had run him afoul of the Youngs on several occasions, was simply in the wrong place at the wrong time. Yet while Evans sees himself as a convenient scapegoat for greater problems within the band, he avoids vilifying the Young brothers and is eager to discuss their considerable talents and assets. To this day Evans still attends AC/DC gigs, never wavering in support for his former band mates. That such loyalty was not reciprocated tastes all the more bitter when it is revealed that Evans was removed from the band’s Rock and Roll Hall of Fame induction in 2003, though he performed on many of the band’s most legendary tracks. Nothing could prepare the reader for the book’s ending, which sees Evans eviscerated by a personal tragedy that ultimately set the book in motion. Dirty Deeds, a fast-moving, hair-blowing joyride, full of fantastic stories, colorful characters and wince-inducing laughs, ends on a somber note, yet it is a richly rewarding experience. Ultimately you find that Mark Evans is far more interesting and exponentially more likable than any band who has ever shared his stage.